Service article I came alone and asked me to help me. Later I looked for other posters and they came to me two. ㅡ ㅡ +++ Besides, I hurried to go to a hurry, And set everything up - ㅡ ㅡ +++ The goods have not arrived yet, and the price has fallen and I have been sick. I am satisfied. It is a perfect size for a flat house of 30. I bought it in early March and it took about 3 weeks to arrive by the end of March. The people who delivered it were kind, and Youtube and Netflix went well. Okay, I think I need a speaker bar. Please note that shipping takes two months. Korean local setting is not available. The installer was kind and relatively fast. If you have a large amount of customs, we will ask you for payment materials for customs at random. We will guide you through the delivery of payment data at the customs office, and we will inform you of the contents received from the customs office. Sometimes it is not a fraud, why are you asking me to hand over this data? We also deliver the contents of the customs, but if you do not send the payment data, the customs clearance and receipt will not be done. Please make sure that we provide you with a note and a letter to tell us that you need to deliver it to us for fast customs clearance / fast TV reception. TV will not be able to track domestic shipments even if the invoice number is issued. Unlike ordinary small cargo, it is treated as a large cargo. When the customs clearance is completed after entering the country, the TV will be taken over to the domestic TV installation company immediately. After taking over the TV, after completing the area classification, the installer of the area will call for confirmation of the additional installation for the desired installation date and wall hanging. If you would like to call the article, hope you can install it on your preferred date. (Please specify the date you made) + Name (handwritten signature) + Handwritten signature: * Please make sure to include your own signature. Thank you for your attachment. The initial failure (damage during delivery / liquid crystal problem after installation) can be returned free of charge seven days after installation date. 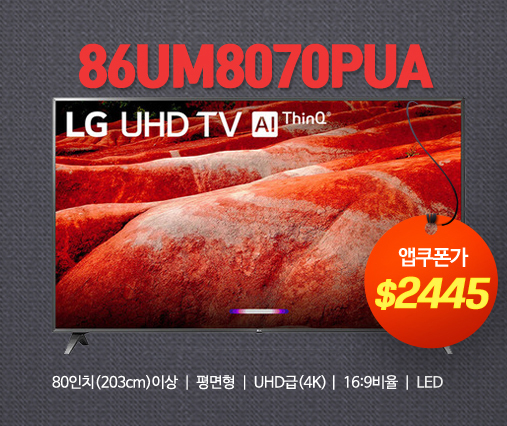 LG TV is available free of charge for 1 year based on the date of arrival at the LG Electronics Service Center. After that, you can pay AS. Please call the LG Customer Service Center (1544-7777) and give us details about the case. If the defect is confirmed after the confirmation by the knighthood, exchange or refund is possible. If it is not defective, it can not be exchanged. If the defect is bad, please write the bad judgment. If you have a bad judgment, please take a picture of the judgment and send it to here. I have installed a TV, but sometimes the picture quality is not enough. Please check if your home set-top box is UHD-compatible. If not compatible, the picture quality may be degraded. The United States has no rating and is an energy star product like Korean standard. In addition, it can be used directly as pig nose with free bolt. As you can see on the internet, the actual users can watch the TV in any way (IPTV, cable, coaxial cable, etc.) and the possibility of voice recognition or UHD broadcasting can be changed. Most users who use IPTV know that voice recognition is good. You can use YouTube or Netflix. 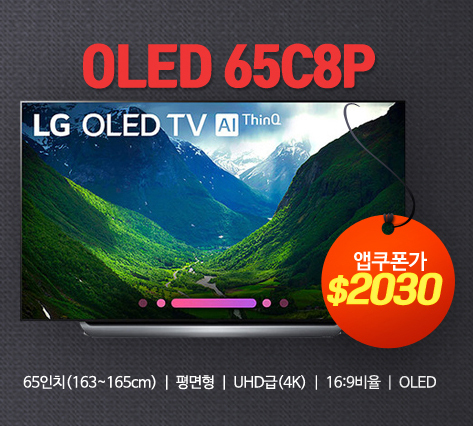 For more information, please contact your local TV provider or the LG Electronics Customer Center (1544-7777). It is necessary to watch with domestic antenna line, but it can not be done after local change. The majority of TVs are manufactured in Mexico. Can Jeju Island be delivered and installed? For the TV family (regardless of model), there is a certain quantity that can be shipped in one day. There is a slight delay. Please note that it is difficult to get accurate schedule information because each model is out of order. We will do our best for prompt processing on the spot. We will register invoice after shipment. For product specifications and detailed specifications, please contact the product brand website or the product customer center.